Buildings under construction near the Hanauma Bay parking lot last month included an interpretive center, snack bar, restrooms and offices. The administration of Mayor Jeremy Harris has approved 14 change orders for the Hanauma Bay Nature Preserve project that have tacked $2.1 million, 20 percent, to the original $10.6 million contract, a Star-Bulletin review shows. The additions also mean that the project now will not be done until mid-May, more than twice as long as initially anticipated. Construction began last April and was supposed to be done by Oct. 1, according to city documents. The $2.1 million in changes also exceed the $1.4 million that had been set aside for contingency purposes. City Managing Director Ben Lee, who could not be reached for comment, said previously that the project is still within the $13 million budgeted for it in 1997 by the City Council. But East Honolulu Councilman John Henry Felix and state Sen. Donna Mercado Kim, who has long raised objections to the Harris administration's change-order policies, said the Hanauma Bay case shows there is a need to tighten reins on construction projects. "We just appear not to have day-to-day control over project management, specifically the cost of the project," Felix said, noting that Lee had given him information on Thursday showing only five change orders totaling $717,468.45. That night, Lee told the Star-Bulletin there were nine change orders approved totaling roughly $1.3 million. On Friday the Star-Bulletin found five more change orders adding $815,328.16 that raised the total project cost to $12.7 million. "It's very troubling," Felix said. "We have computer programs out there for the project managers to be up to date on project costs, and there really is no excuse for having these projects get out of hand." Kim (D, Fort Shafter-Aiea), a former Council member and longtime critic of the Harris administration's change-order practices, said it is disingenuous for city officials to feel free in using all $13 million that was budgeted. "To say it's still under budget is shibai. They're going to run the city broke," Kim said. The bid amount of $10.6 million "is what the contract should be. The rest of the money is supposed to go back to the general fund. They're not supposed to be using it." Kim authored an ordinance that requires the administration to report to the Council any time city construction projects exceed 5 percent of original contract awards. Felix said he now will explore legislation that will put a tighter clamp on change orders. "It appears that we readily have cost overruns, and we should diligently attempt to work toward zero tolerance," he said. "During these challenging fiscal times, it's imperative that we exercise every opportunity to control costs on construction projects. We have been rather lax, and this can no longer be acceptable." Paraphrasing a statement popularly attributed to the late U.S. Sen. Everett Dirksen, Felix added, "A million dollars here, a million dollars there, eventually it adds up to big money." Lee has said funds for the construction come from entry fees to Hanauma Bay paid by tourists, not from taxes. Both private and city architects and planners need to plan construction schemes before projects go out to bid, Felix said. Dave Washino, a spokesman for the East Honolulu Community Coalition, said his organization is not surprised by the amount of change orders. "We have said from the beginning that this project was rushed and that the city did not allow enough time for all who participated to plan and comment," Washino said. The organization, he said, has obtained internal memos showing the projects' planners and architects voicing concerns about having only three months to design the entire project. The administration rushed the design to get the project ready to be bid on by contractors, Washino said. "They were worried about the lapsing of the appropriation." Lapsing of the funds would have meant going back to the Council for approval. The coalition's objection has focused on faux-rock berm structures that are being constructed on the upper portion of the facility. The group says they are unsightly, too tall and obtrusive. The Hanauma Bay changes were pushed by the Harris administration partly as a way of controlling the amount of visitors to the popular attraction. The education center, among the bermed structures on the upper portion, is designed to teach visitors about the fragile coral ecosystem at the bay. The project also includes replacing a snack bar and other structures with facilities on the upper portion. The upper-level changes also include a gift shop and office space. Felix, Washino and other critics note that the $13 million appropriated by the Council actually was based on the original, grander project Harris envisioned for the area. Those plans included moving all parking from Hanauma Bay to a base near Koko Head Crater, where visitors would need to use a shuttle to get to the preserve. The plans, which also included a cable car ride to a scenic lookout at the top of Koko Crater, were nixed by Harris in June 1999 because of community outcry. Felix said he wants to know how the administration can build the improvements without the cable car and still approach that original $13 million appropriation. The Harris administration has approved 14 change orders totaling $2.1 million to a contract with Iida Contracting that originally cost $10.6 million. One of the changes actually gave money back to the city when a work item was deleted. Five of the change orders were given final approval Wednesday. >> Change Order 1: $563,755.03 approved Sept. 10. A number of revisions to "incomplete bid drawings" that include adding and upgrading stainless-steel railings, adding 573 tons of crushed gravel, two sets of stainless-steel sliding doors, 10,000 pounds of steel, a 1,200-square-foot stone walkway paving, electrical wiring, fixture revisions and cabinet millwork. >> Change Order 2: $12,631.06 approved Sept. 10. Removing tree and hauling debris to dump, and installation of drainage pipes. >> Change Order 3: $13,048.44 approved Sept. 10. Creating addition dust barrier to add to existing barrier. >> Change Order 4: $55,000 approved Sept. 10. Hiring security guard during construction off hours, including weekends. >> Change Order 5: $73,033.92 approved Sept. 10. Removal of asbestos material, rerouting of electrical lines that conflict with a new sewage pump station, and repair of water line. >> Change Order 6: $606,155.69 approved Oct. 8. Lowering in-place concrete walls and columns, lowering roof slab, revising slopes of roof slab, lowering floor slab, revising exhibit building's floor plan, adding concrete column, revising imitation rock covering of building, revising and lowering plaza planters and affected stairs, revising sidewalk at parking drop-off, rerouting sewer line, adding ceiling "cloud," adding a door, adding copper scuppers and downspouts, adding air-conditioning unit with ducts, adding all-new roof reinforcing steel and adding new planting material. >> Change Order 7: Return of $30,000 approved Oct. 31. Deletion of decorative metal entry gates. >> Change Order 8: $18,427.27 approved Oct. 31. Providing green stone pavers in lieu of Canpar, and high-security, removable core signature type in lieu of standard Sargent cylinders. >> Change Order 9: $12,822.78 approved Nov. 28. Adding ceramic tile material for completion of restrooms. >> Change Order 10: $164,815.67 approved Wednesday. Revising sewer line, adding staff toilet/shower room, revising information area, revising storage/education alcove/docent room, revising rock work, deleting two skylights at snack shop restrooms, revising training office, revising cabinet work, adding corner guards, deleting railing, revising electrical duct routes, mechanical duct work, and adding a hot-water heater. >> Change Order 11: $127,190 approved Wednesday. Rerouting overhead electrical lines to underground; demolishing and removing existing overhead poles, lines and other equipment. >> Change Order 12: $68,001 approved Wednesday. 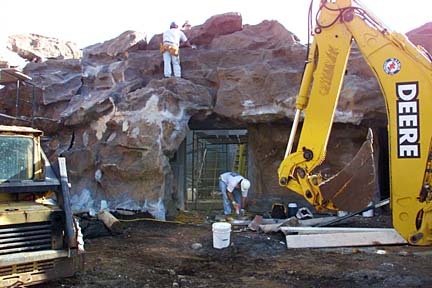 Revising rock work related to lowering of roof slab at exhibit/gift shop building. The change order said, "This cost was part of change order No. 6 but was removed to lower total to bring it below contingency amount." >> Change Order 13: $156,524.54 approved Wednesday. Adding drain inlet, deleting security fencing, revising service entry walkway to snack shop, drain profile, landscaping, rock work to disguise entries, deleting three skylights at staff offices, in-filling skylight openings, revising piping diagrams, air-conditioning duct work, storm drawings, roof drains. >> Change Order 14: $298,796.95 approved Wednesday. Redesigning the bathhouse affecting concrete walls, rock work and entry to women's restroom; redesigning the lifeguard storage building affecting the entry, rock work, concrete walls, extension of the roof and floor slabs, adding seat walls and landscaping; deleting a sprinkler system to the kiosk.